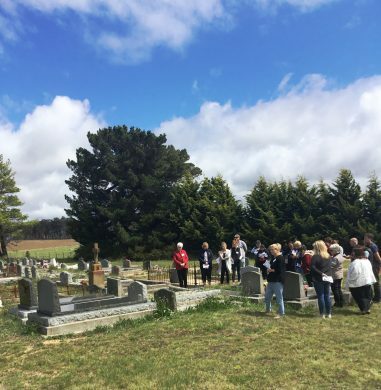 On 19 October, a cool and cloudy morning, 28 people arrived at Oatlands, in the central Midland area of Tasmania, for a pilgrimage to Josephite heartland. The day began with coffee and tea and fresh fruit scones while sharing about all that had happened since the March Josephite Colloquium in Hobart. Some of us shared how the Colloquium had touched us personally, others about initiatives that had been integrated into our place of ministry. All spoke of a heightened awareness of living within the values of the Josephite spirit and how this had led to greater trust in God, reaching out to those in need and being a welcoming, supportive community. Sister Jill expressed her hope that this day would animate us even further. 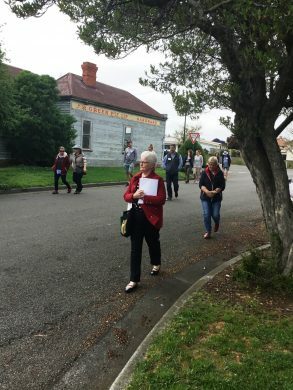 Sister Colleen led a walking tour around Oatlands to places that are of significance in the Tasmanian Josephite story—the former Convent and School and St Paul’s Church where Fr Julian Tenison Woods spent six months as parish priest in 1876. She also shared a photo of the 15 Sisters at their first Chapter gathering held in Oatlands in 1896. 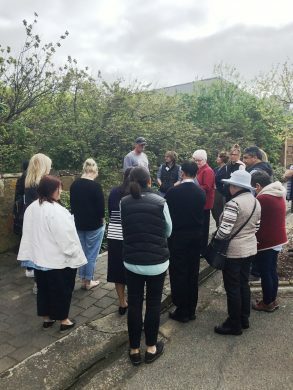 As pilgrims, we moved on to Tunnack where Sister Carmel shared her connection with the area and the possibility that members of her family may have known both Fr Julian and the first Sisters who arrived here in 1891. Unique in the cemetery next to St Brigid’s Church is the grave of Sister Vincent Bowler, the Tasmanian group’s first postulant. For some unknown reason, her grave faces a different direction from all the others! On the road between Tunnack and Colebrook we stopped for prayer and reflection. It was a sacred moment standing in silence with the sun beaming down and the cacophony of the sounds of nature all around. May we be conscious, God of Love, of your presence surrounding us. At Colebrook, we stood outside the former Convent with its many chimneys before heading up the hill to St Patrick’s Church, which has been restored both inside and outside to all its original glory. Brian Andrews, Archdiocesan Heritage Officer, enthralled us with his tales of Augustus Welby Pugin who, in 1843, designed at no cost everything that would be required by Bishop Robert Willson as he set up a new diocese at the far end of the world. The pilgrimage ended as it started—with a cuppa and the presentation of certificates to help us remember the day. Perhaps the most significant part of the day for me was the realisation that we were walking in the footsteps of Fr Julian, seeing much as he saw in this isolated area of Tasmania. When Fr Julian first came to Van Diemen’s Land he was only 22 and not yet ordained. 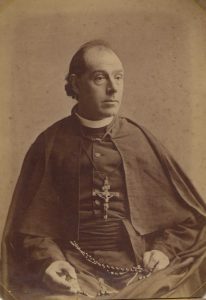 When he returned as priest and missioner in 1874, he celebrated his 42nd and 43rd birthdays here. On 15 November 1874 he was giving a mission at Hamilton. On the same date in 1875 he was in Launceston, seriously ill and convalescing at the home of Mrs Young. On 15 November 1876, his 44th birthday, he left Tasmania, sailing for Melbourne on the Tamar. Photos provided by Carmel Jones rsj. Used with permission.